Obama Nominates Hagel For Defense, Brennan For CIA : The Two-Way The president is moving to fill two key posts on his national security team. If confirmed, former Nebraska Sen. Chuck Hagel (a Republican) would lead the Pentagon. John Brennan, the president's counterterrorism adviser, would be at the Central Intelligence Agency. 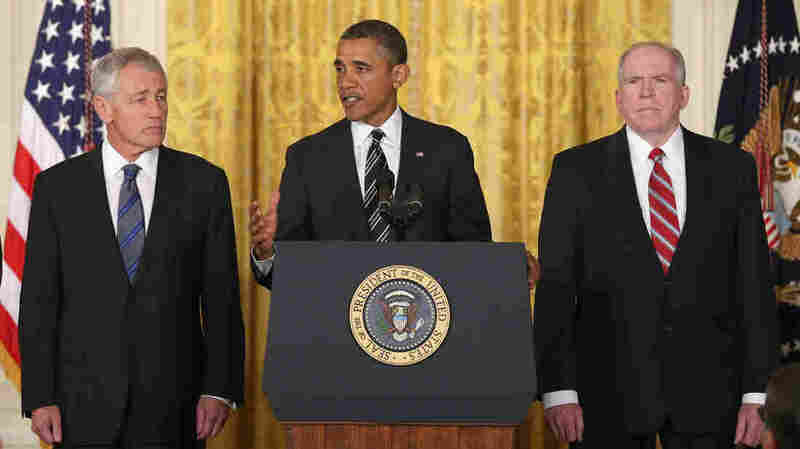 Former Sen. Chuck Hagel, left, President Obama and counterterrorism adviser John Brennan at today's announcement. President Obama this afternoon nominated former Sen. Chuck Hagel, R-Neb., to be his next defense secretary and counterterrorism adviser John Brennan to lead the Central Intelligence Agency. The president praised Hagel, who would be the first former enlisted man to lead the Pentagon, as someone who understands what it is like to fight and bleed in dirt and mud because of his decorated experience with the Army in Vietnam. Obama praised Brennan for his long experience at the CIA and White House and for being a key part of a team that in the last four years took more al-Qaida leaders and commanders off the battlefield than at any other time since the Sept. 11 terrorist attacks. Both men could face some opposition during the Senate confirmation process, as we explain below. We updated this post during the announcement at the White House. As the NPR coverage ends, Senior Washington Editor Ron Elving says that the president's nominations of Hagel, Brennan and Sen. John Kerry, D-Mass., (to be secretary of state) signal that Obama wants to be "a president who redefined tough." Brennan, Ron said, is "known for his toughness" and for being one of the leading proponents of the use of drone strikes against terrorists in Pakistan and elsewhere. Hagel is known "as an independent thinker" and is a decorated war veteran. And Kerry also comes with the background of service in the U.S. Navy during the Vietnam War. In his concluding comments, the president says he hopes the Senate will move quickly to confirm Hagel and Brennan because "we don't like to leave a lot of gaps" in key posts. After hailing the men and women of the CIA as "dedicated, courageous, selfless and hardworking," Brennan says they achieve things that will "never be known outside the hallowed halls of [CIA headquarters] and the Oval Office." Serving as CIA director, Brennan says, would be the "greatest privilege and greatest responsibility of my professional life." Brennan adds that he considers himself "neither a Republican nor a Democrat" and looks forward to working with lawmakers from both parties. In brief remarks, Hagel tells the president he will "always do my best ... for our country ... for those I represent at the Pentagon and for all our citizens." Outgoing Defense Secretary Leon Panetta, after praising the choices of Hagel and Brennan, says that after 50 years in public service he's looking forward to returning to his walnut farm in California where he'll be "dealing with a different set of nuts." That gets a good laugh. Turning to his remarks about Brennan, the president says he is "legendary ... for working hard. ... I"m not sure he's slept in four years." And Obama notes that with Brennan in a top counterterrorism position, "more al-Qaida leaders and commanders have been removed from the battlefield than at any time" since the Sept. 11, 2001, terrorist attacks. — John Brennan's White House biography. — Former Sen. Chuck Hagel's Atlantic Council biography. Continuing to speak about Hagel's service as a young man, when he was twice wounded in Vietnam, the president says the former senator "knows that war is not an abstraction. ... [That] sending young Americans to fight and bleed in the dirt and mud is something we only do if it's absolutely necessary." Obama also says Hagel "represents a bipartisan tradition we need more of in Washington." Recapping Hagel's service as an enlisted soldier in the Army during the Vietnam War, the president calls him a Pentagon leader "our troops deserve." As we noted earlier, Hagel would be the first enlisted man to serve as secretary of Defense. The president, Hagel and Brennan are at the podium. Hagel, 66, would replace Defense Secretary Leon Panetta, who wishes to retire. He served two terms in the Senate before retiring in 2009. Hagel would be the first former enlisted man to run the Pentagon — he served with the U.S. Army in Vietnam, receiving two Purple Hearts and other honors. Brennan, 57, would fill the CIA post that opened up in November when Director David Petraeus resigned because of an extramarital affair. Hagel has already drawn opposition from some conservatives because he opposed the Bush administration's decision to go into war with Iraq and has supported efforts to include Iran in talks on Afghanistan. He has also drawn criticism for past remarks about the influence of what he referred to as the "Jewish lobby" and for a 1998 comment about a nominee for an ambassador's post who he said was "openly, aggressively gay." Hagel has apologized for that remark. Brennan could be controversial because his previous work at the CIA included a stint as deputy executive director during President George W. Bush's administration at a time when waterboarding and other harsh interrogation methods were used on suspected terrorists. His past comments defending some things that were done (though not waterboarding) have drawn criticism.